A company is in essence a collection of activities that are performed to design, produce, market, deliver and support its product (or service). It’s goal is to produce the products in such a way that they have a greater value (to customers) than the orginal cost of creating these products. The added value can be considered the profits and is often indicated as ‘margin’. A systematic way of examining all of these internal activities and how they interact is necessary when analyzing the sources of competitive advantage. A company gains competitive advantage by performing strategically important activities more cheaply or better than its competitors. Michael Porter’s value chain helps disaggregating a company into its strategically relevant activities, thereby creating a clear overview of the internal organization. Based on this overview managers are better able to assess where true value is created and where improvements can be made. One company’s value chain is embedded in a larger stream of activities that can be considered the supply chain or as Porter mentions it: the Value System. Suppliers have a value chain (upstream value) that create and deliver the purchased inputs. In addition, many products pass through the value chain of channels (channel value) on their way to the buyer. A company’s product eventually becomes part of its buyer’s value chain. 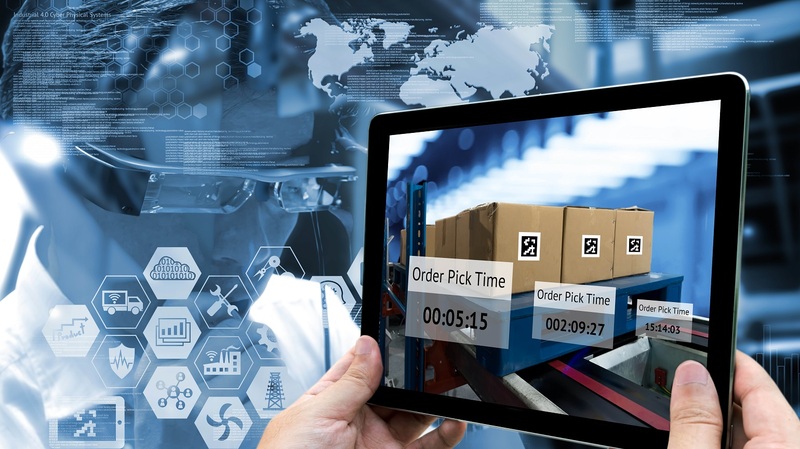 This article will not go into the entire supply chain (from suppliers all the way to the end-consumer), but rather focuses on one organization’s value chain. 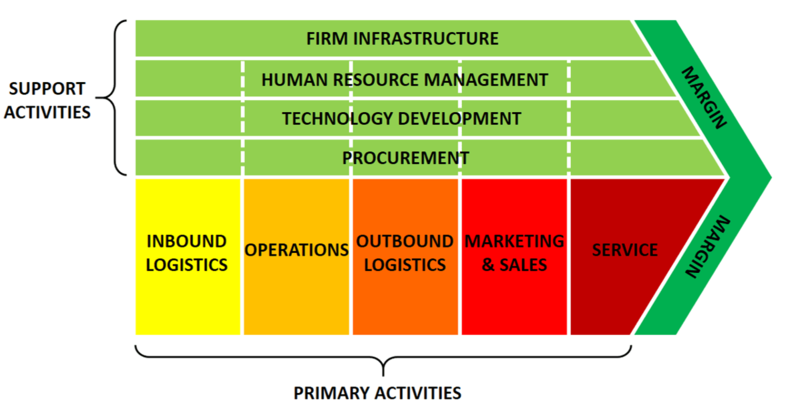 The value chain activities can be divided into two broader types: primary activities and support activities. The first are primary activities which include the five main activities. All five activities are directly involved in the production and selling of the actual product. They cover the physical creation of the product, its sales, transfer to the buyer as well as after sale assistance. The five primary activities are inbound logistics, operations, outbound logistics, marketing & sales and service. Even though the importance of each category may vary from industry to industry, all of these activities will be present to some degree in each organization and play at least some role in competitive advantage. Inbound logistics is where purchased inputs suchs as raw materials are often taken care of. Because of this function, it is also in contact with external companies such as suppliers. The activities associated with inbound logistics are receiving, storing and disseminating inputs to the product. Examples: material handling, warehousing, inventory control, vehicle scheduling and returns to suppliers. Once the required materials have been collected internally, operations can convert the inputs in the desired product. This phase is typically where the factory conveyor belts are being used. The activities associated with operations are therefore transforming inputs into the final product form. Examples: machining, packaging, assembly, equipment maintenance, testing, printing and facility operations. After the final product is finished it still needs to finds it way to the customer. Depending on how lean the company is, the product can be shipped right away or has to be stored for a while. The activities associated with outbound logistics are collecting, storing and physically distributing the product to buyers. Examples: finished goods warehousing, material handling, delivery vehicle operations, order processing and scheduling. The fact that products are produced doesn’t automatically mean that there are people willing to purchase them. This is where marketing and sales come into place. It is the job of marketeers and sales agents to make sure that potential customers are aware of the product and are seriously considering to purchase them. Activities associated with marketing and sales are therefore to provide a means by which buyers can purchase the product and induce them to do so. Examples: advertising, promotion, sales force, quoting, channel selection, channel relations and pricing. A good tool to structure the entire marketing process is the Marketing Funnel. In today’s economy, after-sales service is just as important as promotional activities. Complaints from unsatisfied customers are easily spread and shared due to the internet and the consequences on your company’s reputation might be vast. It is therefore important to have the right customer service practices in place. The activities associated with this part of the value chain are providing service to enhance or maintain the value of the product after it has been sold and delivered. Examples: installation, repair, training, parts supply and product adjustment. The second category is support activities. They go across the primary activities and aim to coordinate and support their functions as best as possible with eachother by providing purchased inputs, technology, human resources and various firm wide managing functions. The support activities can therefore be divided into procurement, technology development (R&D), human resource management and firm infrastructure. 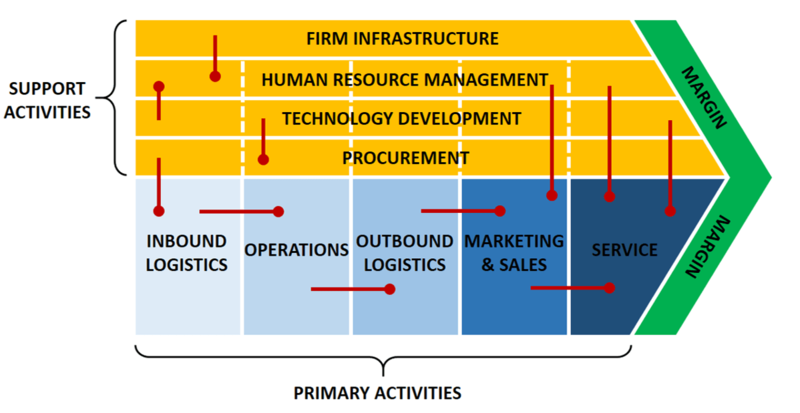 The dotted lines reflect the fact that procurement, technology development and human resource management can be associated with specific primary activities as well as support the entire value chain. Procurement refers to the function of purchasing inputs used in the firm’s value chain, not the purchased inputs themselves. Purchased inputs are needed for every value activity, including support activities. Purchased inputs include raw materials, supplies and other consumable items as well as assets such as machinery, laboratory equipment, office equipment and buildings. Procurement is therefore needed to assist multiple value chain activities, not just inbound logistics. Every value activity embodies technology, be it know how, procedures or technology embodied in process equipment. The array of technology used in most companies is very broad. Technology development activities can be grouped into efforts to improve the product and the process. Examples are telecommunication technology, accounting automation software, product design research and customer servicing procedures. Typically, Research & Development departments can also be classified here. HRM consists of activities involved in the recruiting, hiring (and firing), training, development and compensation of all types of personnel. HRM affects the competitive advantage in any firm through its role in determining the skills and motivation of employees and the cost of hiring and training them. Some companies (especially in the technological and advisory service industry) rely so much on talented employees, that they have devoted an entire Talent Management department within HRM to recruit and train the best of the best university graduates. Firm infrastructure consists of a number of activities including general (strategic) management, planning, finance, accounting, legal, government affairs and quality management. Infrastructure usually supports the entire value chain, and not individual activities. In accounting, many firm infrastructure activities are often collectively indicated as ‘overhead’ costs. However, these activities shouldn’t be underestimated since they could be one of the most powerful sources of competitive advantage. After all, strategic management is often the starting point from which all smaller decisions in the firm are being based on. The wrong strategy will make it extra hard for people on the workfloor to perform well. Although value activities are the building blocks of competitive advantage, the value chain is not a collection of independent activities. Rather, it is a system of interdependent activities that are related by linkages within the value chain. Decisions made in one value activity (e.g. procurement) may affect another value activity (e.g. operations). Since procurement has the responsibility over the quality of the purchased inputs, it will probably affect the production costs (operations), inspections costs (operations) and eventually even the product quality. In addition, a good working automated phone menu for customers (technology development) will allow customers to reach the right support assistant faster (service). Clear communication between and coordination across value chain activities are therefore just as important as the activities itself. Consequently, a company also needs to optimize these linkages in order to achieve competitive advantage. Unfortunately these linkages are often very subtle and go unrecognized by the management thereby missing out on great improvement opportunities. In the end, Porter’s Value Chain is a great framework to examine the internal organization. It allows a more structured approach of assessing where in the organization true value is created and where costs can be reduced in order to boost the margins. It also allows to improve communication between departments. Combining the Value Chain with the VRIO Framework is a good starting point for an internal analysis. In case you are interested in the entire supply chain, you could repeat the process by adding the value chains of your company’s suppliers and buyers and place them in front and behind your own company’s value chain.